Villages are not located randomly across the landscape and the reason for the establishment of a settlement at Broadmayne probably started in prehistoric times. Its survival and development have depended on natural resources and connections to neighbouring settlements. The most important requirement for a settlement is of course a reliable source of clean water. Broadmayne is at the confluence of several valleys running off the chalk ridge to the south of the village. In prehistoric times the valleys probably contained winterbournes, but it is likely the only permanent source was close to the present spring in the village, the source of the Tadnoll Brook, where all the drainage converged. People have been living here for at least 6,000 years: it is rare that evidence of so long a period of habitation exists in one place. Flint tools have been found from the Stone Age (9000 to 4000BC) and the rare burial Bank Barrow near Culliford Tree dates from the Neolithic (4000 to 2500BC). Burials from the Bronze Age (2500 to 700BC) were found in the construction of Conway Drive with skeletons and two Beaker pots (one of which is now in the Dorset County Museum). A grain store and an oven were also found, dating from the Iron Age (700 BC to the Roman invasion), and at the same site a Roman cyst (coffin) was discovered. In Knighton Lane a limestone rooﬁng slab was found, suggesting a Roman building nearby, and, leaping forward in time, recent excavations have revealed pottery and other finds from medieval times. In the seventh century, Broadmayne offered just the sort of site the Anglo-Saxons liked – tucked away in a valley, with water at hand, out of sight of the coast with its marauding pirates and away from the decaying Roman roads that might still offer a thoroughfare for inland pillagers. Nearly every village we know today was in existence by the time of the Norman Conquest, and is still called by a modernised version of its Anglo-Saxon name. Broadmayne’s name is exceptional in having even earlier roots, for Mayne comes from the Celtic ‘maen’ meaning a stone. The fact that the Anglo-Saxons took the name over from their British predecessors suggests that they did at any rate settle down fairly peaceably together and the Britons were not driven out. The Domesday Book lists two Maines in 1086. The name of Broadmayne ﬁrst appears in full in 1202, as Brademaene, so called to distinguish it from Parva Maene, which became Little Mayne. Parishes, like villages, were largely the work of the Anglo-Saxons. In medieval times each parish needed to be largely self-sufficient. The fairest way to do this was to ensure they included a wide range of the resources available in the locality. 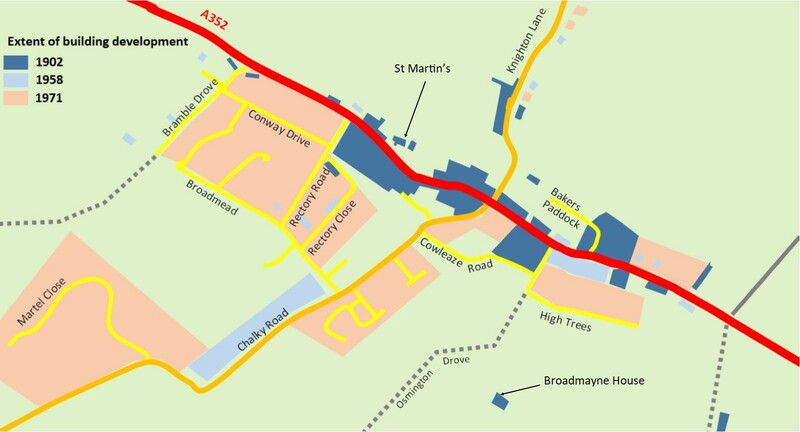 Broadmayne and its neighbours have a range of soils: the thin, well-drained chalk soils in the south suitable for winter grazing, fertile valley soils for growing crops and the infertile heathlands to the north where rough grazing, bedding and firewood were available. Although they were ecclesiastical units, their boundaries commonly followed those of existing estates, possibly even as far back as the pre-Saxon, Romano-British estates. Alongside the church parish, the Saxons set out the early framework of local government. Apart from the church, none of Broadmayne’s surviving buildings date from before the late 16th century. Until then, even the more prosperous of its inhabitants would have lived in timber-and-cob houses that were dark, draughty, uncomfortable, and all too quick to catch ﬁre, while the dwellings of the labourers would have been little more than hovels. Like the great majority of Dorset villages, Broadmayne is a ‘street’ village, where church and chapel, farmhouses and their outbuildings, public houses and cottages and trade premises have grown up in a string along the main street or very close to it, and it is plain to see in the ribbon-like distribution of the village buildings of the 17th, 18th and 19th centuries. It was an obviously convenient lay-out for the original valley settlement, and was kept in being by the communal grazing on the downs, which lasted in Broadmayne until the lnclosure Award of 1811, and limited the spread of building. In addition to the range of soils previously referred to, Broadmayne had extensive clay deposits to the north of the parish that would provide a source of income from brickmaking. The Broadmayne brickworks was mentioned as far back as 1724 and for many years, until the Second World War in fact, was a going concern. The bricks were used far and wide in the building trade, and to this day are valued. The brickworks employed as many as 20 – 25 people, some for their entire working life. At the beginning of the 20th century, some three-ﬁfths of the parish of Broadmayne and most of the village was still owned by the Lord of the Manor, then Mr. John Roberts Furmedge. In 1911 the whole Manorial Estate, covering 572 acres, was put up for auction in several lots. Besides the farms, the estate included the small Cold Park Wood, the Black Dog Inn, the brickfield and yard, 23 cottages and various business premises — and the title of Lord of the Manor, which was bought by an estate agent in Dorchester. Manor Farm, Church Farm and Charlemont Farm were still farmed from houses of 17th century date on Main Street, surrounded by farm buildings such as granaries, cow stalls, stables, piggeries and dairy houses. In 1961, Charlmont Farm — having dropped its ‘e’ by then — came on the market again; but a few years later the farmhouse and buildings, at the junction of Knighton Lane and Main Street, were burnt down, and the site was used for new housing. At the approach of D-Day in 1944, the village was covered with Nissen huts and tents. Some of the Nissen huts remained for a while as much-needed homes, but there was very little additional housing by 1958. The largest change in recent history was brought about by an Atomic Energy Authority establishment being created on Winfrith Heath in the late 1950s. This was a research department from Harwell, eventually accommodating some 2,000 workers. The County prepared for this influx in the area, particularly families, and large estates were created in Dorchester. However, the County officials were keen to spread the new residents around and Broadmayne had its share of development in the late 1950s and 60s. Martel Close and Conway Drive were created by 1960, as were Rectory Road and Close. In 1967, Broadmead was completed and some years after, Littlemead was built. Along Knighton Lane, towards West Knighton, the Oakwood estate and Old Brickfields were built in the 1980s, and several individual houses constructed in the village. There has been no major development since then, but there has been a degree of infilling, particularly when older houses have come onto the market and additional properties have been built in their gardens.